Coach John Peacock says Venice High School has had only one player suffer a concussion in the last two years, but he says even one is too many. VENICE, Fla. -- The death of a high school football player in Georgia from a head concussion has some wondering how safe players are on the field. 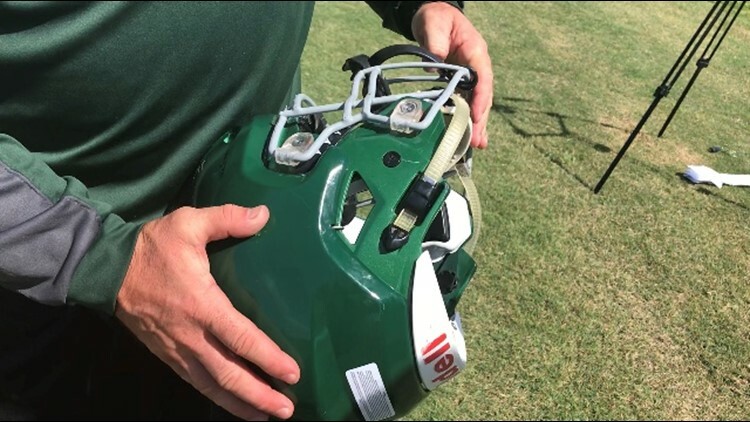 Venice High School’s Head Football Coach John Peacock says it comes down to equipment and technique learned in practice. The Venice High School Indians are the defending Division 7A State Champions. The team sees some of the best teams and some aggressive football on the field. Peacock says during practice his players wear an extra layer of protection on their helmets. The foam padding fits over their helmets, costs $120 and is made by a company called Defend Your Head. The helmet is a protective shield, but Peacock says the technique on the field is crucial. “We teach them to tackle without getting their heads involved…rugby style,” Peacock says. If there is suspicion of a head injury, Peacock says the player is taken out immediately. “They see an athletic trainer, and if they have a head injury, they go into concussion protocol for a minimum of 10 days,” explains Peacock. As for high tech helmets with technology that measures head impact, Peacock keeps those off the field. Peacock says it’s heartbreaking to hear about a high school football player who died from a concussion. That’s why practice is so important. Coach Peacock says Venice High School has had only one player suffer a concussion in the last two years, but he says even one is too many.